My first exposure to Guns N’ Roses* (and let’s be honest, “exposure” is the correct term to use when discussing GNR) was the music video for “November Rain”. Originally, I only saw bits and pieces of the video from the various countdowns and clip shows that made up a large portion of MTV’s programming of the mid-90’s, though interspersed in that footage may have been their performance that one time when Elton John joined them for some reason. 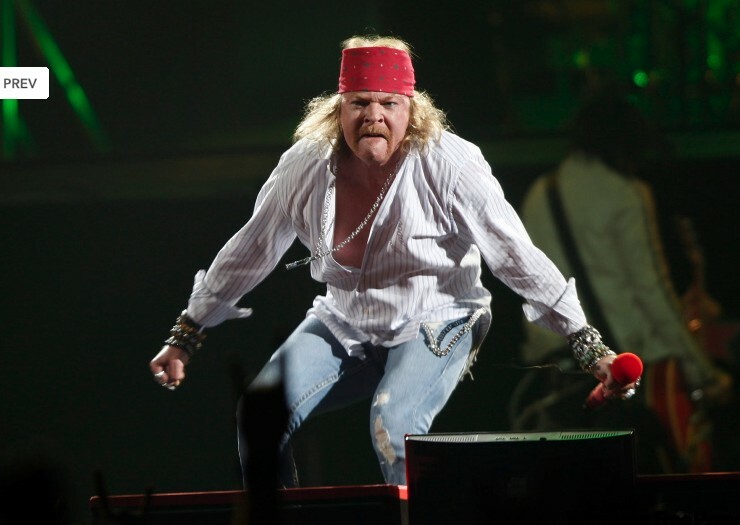 Sure, there’s a strong likelihood that I probably saw a movie trailer that was backed by the strains of “Welcome to the Jungle”, but it never registered with me, so my first association with Guns N’ Roses wasn’t that they were dangerous hard-rockers, but overwrought balladeers. I say that with the kindest intent possible, because as ridiculous as everything associated with “November Rain” is, I will admit that as a piece of music it still holds up–its movements are well-constructed, it actually generates some passion in the listener, and Slash’s guitar solos are damn good. The saddest moment of my childhood was not when I found out the truth about Santa Claus, but when I realized that nobody could hear Slash’s epic guitar solo outside that church in the desert. Of course I realize no one would actually hear it because there’s no audience out there in the desert, but it’s the fact that Slash’s guitar isn’t plugged into anything that rammed the message home. And considering the noise from the helicopter swooping all around to capture that iconic scene, I doubt Slash could even hear himself as he poured his heart out into that solo. NOBODY CAN HEAR HIS PAIN TRANSMITTED THROUGH THE PURE MAJESTY OF MUSIC! It’s easy to see that this video was the clearest example of the various symptoms that would plague the band for the rest of their career, and was but a microcosm of the ridiculous excess that would plague the enduring debacle that was Chinese Democracy. Still, this song and video is a definite highlight when this time of year comes along, no matter how ridiculous and nonsensical the entire enterprise is. Story Time: About ten years ago, when I was on break from college, I was hanging out at my friend’s house, and joining us was his girlfriend at the time. She was a massive Guns N’ Roses fan, and was extremely excited to see the video playing on my friend’s TV. I took the opportunity to mention my various grievances with the video, namely the fact NOBODY CAN HEAR SLASH’S AMAZING GUITAR SOLO and the small fact that the entire video makes absolutely no sense. This besmirchment of the good name of Guns N’ Roses was too much for her to handle, so she threatened me with eviction from the premises if I said anything else (note: if you recall, this was in fact not her home, but my friend’s). So I shut up for a good two minutes, before I air-drummed one of those slow fills and sang “Bum Ba-da-dum Bum!” Despite the fact that I was showing my appreciation for the music emanating from the television speakers, this was TOO MUCH for the woman, and I was yelled at until I left the house. I don’t think I ever saw her again, and my friend broke up with her not long after this incident. That’s how you end a story, Axl. *It bugs the hell out of me that they write their name with the apostrophe after the ‘N’, but what are you going to do? **Let’s take a second to acknowledge how well Stephanie Seymour has held up over the years as opposed to the trainwreck that Axl became. Well done, Mrs. Seymour.